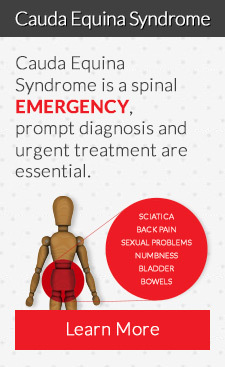 Below are symptoms of Cauda Equina syndrome - known as Red Flags. These require urgent attention from an appropriate healthcare professional. ‘Red flags’ is a term commonly used when talking about cauda equina syndrome. These are a set of symptoms that occur during the onset of cauda equina syndrome. When they occur either some or combination of, they should lead a medical professional to suspect a diagnosis of cauda equina syndrome. Red flags are extremely important as early recognition can lead to correct timely diagnosis and treatment. Treatment within 24 hours will almost always lead to the patient making a near or full recovery after surgery. 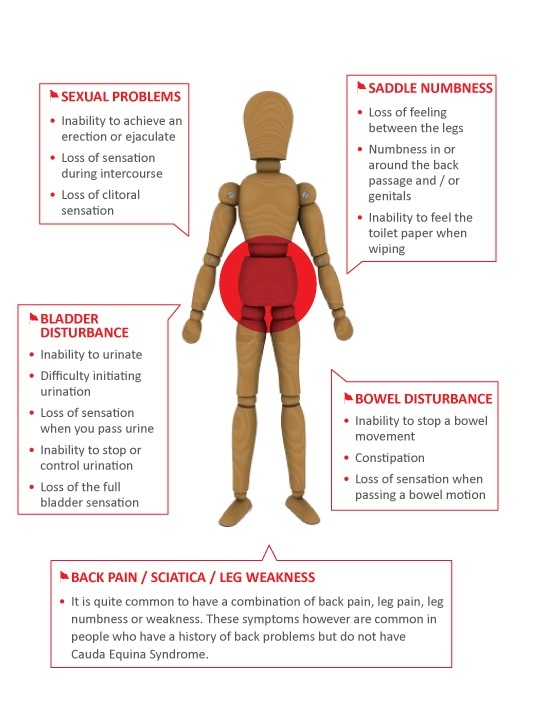 If you (or a patient) experiences these symptoms and Cauda Equina Syndrome is considered you ideally require definitive investigation(s) and management to diagnose (or rule out) the condition within 24-48 hours of onset of the red flag symptoms. This is to optimise the chance of neurological recovery. Bladder scanning for residual urine after emptying and also lack of catheter sensation can be instrumental in helping clinicians establish compression of the cauda equina nerves. Once you receive a diagnosis, here at CESA we are on hand to support you. 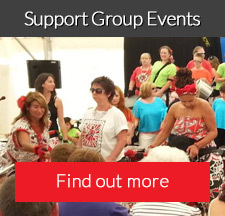 You may feel scared and bewildered but as our team speak from first-hand experience we can offer free support and signpost you to the best organisations.